Sorry Prof. Zimmerman, but I have to disagree here. When your country is attacked, it is natural (especially for the male of the species) to be full of anger and even hatred toward the attacker. I'm a New Yorker. My country and city were attacked, and I am filled with hatred at the people who did it in the name of their perverted brand of religion. What I see now is what played out in Spain in the 12th century. Fanatical Muslims, the Al-Muahadin (Almohades) poured in from North Africa, took over, and destroyed the regime of "convivencia," where Muslims, Christians and Jews lived together in relative harmony and advanced human civilization immeasurably. Maimonides and others had to flee to other lands, much to the detriment of Spanish culture and civilization. Of course there are moderate Muslims, but they are not heard above the din of fanaticism emanating from Saudi Arabia, which has unlimited funds to spread their Wahhabi cancer through madrassas around the globe. The Imam Letter can help stop this madness, but only if knowledge of it spreads beyond the scientific community. We need all moderate Muslims, especially those still in positions of authority, to SPEAK UP LOUD AND CLEAR that terrorism is vile and anti-Islamic. By the way, since you will not reproduce those "vile names," your readers have no way to evaluate their vileness. This is not the first time that I posted comments to Prof. Zimmerman's columns in Huffington Post, but for the first time my comment was rejected. I sent a copy to Prof. Zimmeerman, who was surprised that the comment was rejected. He assured me that Huff Post's editors, not he, make the decisons on what comments to publish. I believe him. He says he has no idea why my comment was blue-penciled. I have an idea. There is a taboo in our society against criticizing Muslims. All other religion and their clergy are fair game for criticism, lampooning, cartoons and the like. None of the objects of all this respond with violence - except Muslims. Nor is this something new. Years ago, a movie called "Muhammad, Messenger of God" debuted in theaters. It showed images of Muhammad that some Muslims deemed blasphemous. After a bomb threat (or maybe an actual bomb, I don't remember) at a theater in Washington, D.C., the theater canceled the movie and other theaters declined to show it. Later the movie was edited to remove depictions of Muhammad and was retitled "The Message." At the time, such violence and threats were rare. Today, especially in Europe, it is becoming routine. But our response is as craven now as it was then. Dutch politician Geert Wilders must travel under guard because he has received death threats for fearlessly sounding the alarm about an Islamic takeover of Europe. 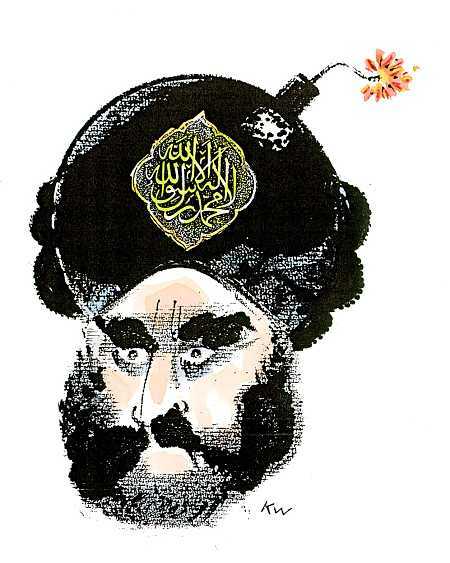 Danish newspapers were threatened for publishing cartoons making fun of Islam's penchant for violence, and now censor themselves accordingly. Dutch film director Theo van Gogh was assassinated because he had the temerity to make a film critical of Islam's treatment of women. And on and on. I suspect that this is the reason my comment was too hot for Huffington Post to handle. Freedom is not free. It must be defended in every generation. In my youth the enemy was Communism. Today it is Islamic fascism. If our country ceases to be the home of the brave, it will not be the land of the free much longer.